OSWEGO, NY – City of Oswego Mayoral candidate Amy Tresidder addressed Rotary Club members recently. Tresidder spoke of her passion to improve the quality of living in Oswego. Tresidder is also an Oswego County Legislator representing the 16th District of Oswego County. 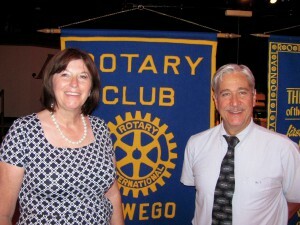 Pictured are: Amy Tresidder and club President Richard Tesoriero.